Teaching Blog Addict is celebrating Christmas in July with an awesome Christmas Craft Linky Party! I LOVE Christmas! It’s such a magical time in first grade. For the last two years I have made the most fun Christmas ornaments with my class. It is definitely not my original idea but one that I had to share with you all in case you haven’t seen it or you’ve forgotten about it. 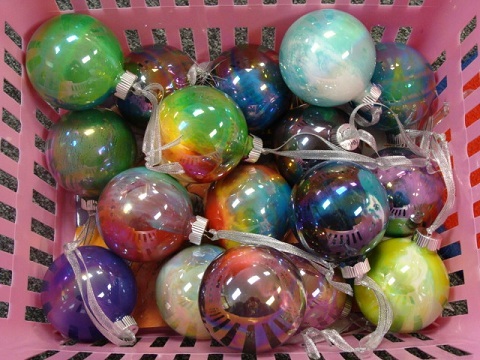 * Clear glass ornaments: I always buy mine at Hobby Lobby. (Hint: Buy them in the summer time when they start putting out Christmas items. Usually they have a 50% off sale sometime. If your store doesn’t have an actual aisle of Christmas stuff out yet, look on the aisle where they have wooden items to paint/decorate. They usually have some there. If not, don’t worry! They WILL show up in the store sometime before Christmas and Hobby Lobby always has good sales! Tip: Make sure to buy some extra because some may break if you aren’t careful!) They make regular clean ones and ones that are sort of iridescent. I buy the iridescent ones because it makes them look so much more shiny and pretty in my opinion! * Paper, plastic, or styrofoam cups: You will want some cups to let your ornament drain into. Some people use egg cartons or the actual insert the ornamants came in but I prefer cups. Why? You can write each student’s name on a cup so it’s easy to tell whose is whose. Clear plastic cups are great because you can see the paint draining out into the bottom of the cup. * Some sort of ribbon or string: You will obviously want to hang up these beautiful ornaments, so you’ll need some sort of hanging material since the ornaments do not come with any. I buy ribbons from Hobby Lobby. They are sort of sparkly ribbons for ornaments that I find in the Christmas department. They make silver and gold I believe. Again, buy them when Hobby Lobby has a good sale! That’s it! That’s all you need! I recommend trying one for yourself at home before having your studens make them. 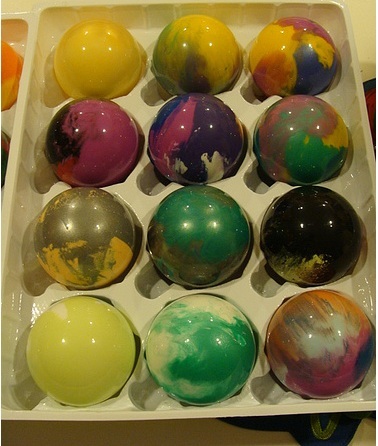 You will want to practice with the amount of paint you squirt inside the ornament. 1. Remove the tops of the ornaments (the wire and the “lid”). Do not have the students do this themselves! Remove them ahead of time! Be careful when removing them. You could mess up the lid and even crack the glass part of the ornament that the lid fits over! 2. Have students choose two colors of paint. Squeeze a steam of paint into the ornament, letting it run down the side of the ornament. Rotate the ornament and squeeze another stream of paint down the opposite side of the ornament. Repeat this process with the other color of paint. Squeeze a stream of paint inbetween the two streams already there and then directly across from it. 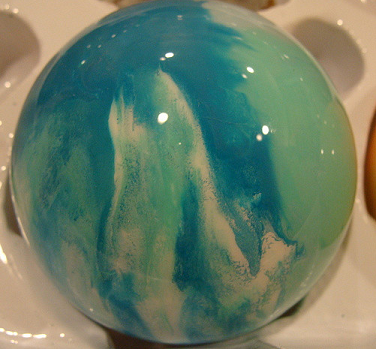 You do want to have a “pool” of paint at the bottom of the ornament so there will be enough paint to slide around and get good coverage. 4. When a student thinks they are totally finished and their ornament is covered, have them turn the ornament upside down (over the cup) and sit it on top of the cup so it fits inside it. No NOT push the ornament down into the cup so it’s in there tightly. Then it will be hard to get out! Sit the cups on a shelf or windowsill or somewhere out of the way. 5. Let the ornaments drain for at least two days. 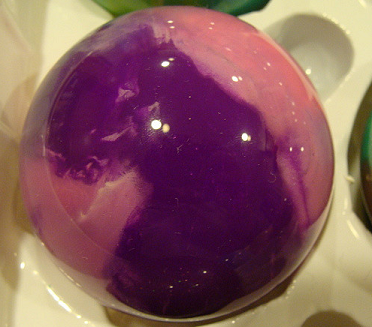 The excess paint will drip out into the bottom of the cup. (This looks really neat!) Remove the ornament from the cup when the paint has drained out, add the wire/lid back onto the ornament and then add a ribbon or hook to hang. That’s it! I’ve read some pages that say wash the ornament out first before adding paint and letting it dry a couple of days. I’ve read to rinse the ornaments with alcohol. I’ve found that it really makes no difference if you do either of these things and I usually don’t to save myself some time. The first year I made these, I had an angry little girl in my classroom. She was a bully. She got mad and slammed her ornament down on the table (on purpose) and her ornament shattered glass and paint everywhere. I did not let her make another one. I always tell my students to STAY IN THEIR SEATS when we are making these. I had no help when making these so it was just me and 20+ kids in the room. It takes time to squirt all the paint in each ornament so as I was filling the ornaments and giving them to the kids I told them to go to their tables and sit down while I filled the others. The kids get SO excited when making these and they just LOVE to go show their friends what theirs looks like. Well, one little girl was out of her seat, walking around to show someone else, and she accidentally dropped hers. She was very upset. I DID let her make another one the next day when I let my absent students make theirs. Last year I hung all of the ornaments on our classroom tree. It looked AWESOME! Even kids who chose the same colors had different looking ornaments! Well, one afternoon as the kids were getting ready to leave RIGHT before the bell was going to ring, one of the kids “fell” into the tree. (They sort of squeezed between it and someone else to get in line). The WHOLE TREE fell over onto the ground. I heard screaming and shattering and it was a terrible sight! Kids were crying that their ornament was runied and they worked so hard on it. I sat the tree back up. LUCKILY, only 2 or 3 ornaments “died.” It was quite a mess to clean up though. I let the kids make new ones if theirs broke. So yes, bad things can happen but it is SO WORTH IT because they turn out looking awesome and the kids just LOVE it! Just make sure you MODEL how to make the ornament. Emphasize them staying in their seat and how important it is to be careful. Visit Teaching Blog Addict for MORE Christmas Craft ideas! Super cute! I was just in Hobby Lobby yesterday and there were about 3 full rows of Christmas stuff!! These are beautiful!!! Thanks for a GREAT idea! They turned out absolutely beautiful!! These are so neat! Thanks for sharing! I definitely want to have my kiddos make these this year! I’ve done these too! And I do have to say they all turn out so cute and different! I’ve lucked out with a high school helper who has done it for me the past 2 years–however IF I had to do it myself, I would do it during a time where I could call up a small group of students like 3-4 and let them make theirs and then call up another 3-4. That way I don’t have them all waiting for me to come around. 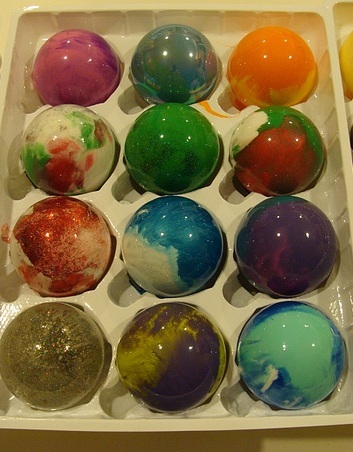 I’ve also let the balls rest on each side before draining them…once I didn’t do that and some of the paint didn’t stick and you could kind of see through it 🙁 But the kids sure do love them! Oh and I even wrote on them with a silver sharpie paint pen with each child’s name and the year!. I have done this project twice with first grade students. I went very well. Thank you for such a detailed explanation. I think these decorations are beautiful. This is always one of our stations on our Christmas Crafts Day. I choose 5 different crafts and get 1 or 2 parents to help man each station and we rotate within our classroom to complete all of the crafts. It’s so much fun! I LOVE THESE! I want to do some now! 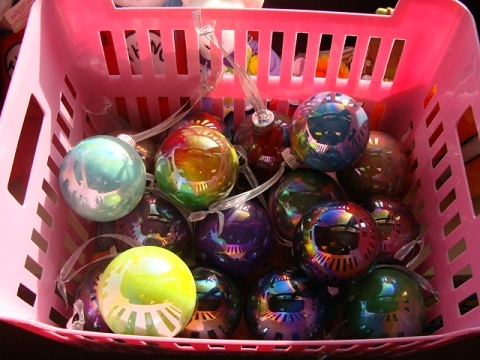 My mom always does themed trees & she has a 60’s tree…these would be a nice added touch. I am so doing these with my students this year! How do you get them home without breaking them? Does this not work with the plastic ornaments? I just bought some plastic ones for a project with my 3 year old but would like to try this as well. Maybe the paint doesn’t “stick” to plastic? I would think plastic would work also. I’m pretty sure I’ve heard of others using plastic but I personally have not.